Amazing helpful staff. Beautiful room. Unbeatable view. We’d stay here a hundred times out of a hundred. Great location, beautiful pool area, friendly and accommodating staff. Staff, room amenities, breathtaking views, location. We were on a girls trip in Santorini for 3 nights and this hotel was incredible! The staff was excellent & on it! The views and location are unbeatable - and the breakfast was fantastic!! I would highly recommend this hotel to anyone staying in Santorini! I cannot say enough wonderful things about Nostos Apartments. The view is unbelievable and the hotel is quaint! Stefanos and the entire staff are friendly, helpful, and always available. They arranged a transfer to and from the hotel, plus all of our excursions and reservations. The included breakfast was delicious and has a great view over the pool to the caldera. To note, there are quite a few stairs to get to hotel (although staff takes care of your bags and we liked the exercise). The location is ideal as it is right at the start of town so we appreciated it was a bit quieter. Our time here became one of our favorite parts of the trip. I would absolutely recommend and will be back!!! 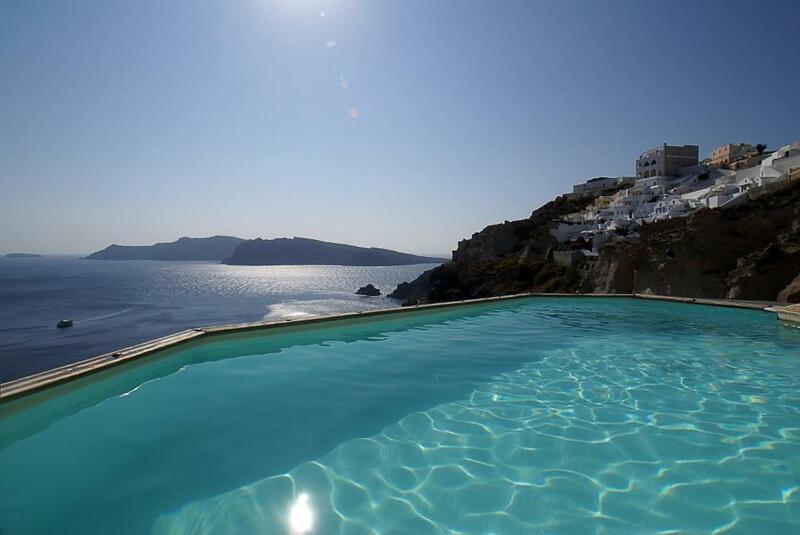 Nostos was the perfect place to stay with an ideal location in Oia and with views that pictures couldn’t do justice. The staff was incredible with genuine hospitality always willing to help in big and small ways. We loved staying here. The best location with the best view and most lovely staff! The rooms were beautiful and each one is unique! The breakfast is fantastic and the hostess was so helpful and friendly! We loved having our own private hot tub with our room. The owners were so helpful and friendly! Stefanos, Yanis, and entire staff was extremely nice and helpful. Beautiful property! Lock in a great price for Nostos Apartments – rated 9.4 by recent guests! Nostos Apartments This rating is a reflection of how the property compares to the industry standard when it comes to price, facilities and services available. It's based on a self-evaluation by the property. Use this rating to help choose your stay! In Oia, these Santorini Apartments feature local character, hand-crafted furniture and private porches overlooking the volcano and the sea. The complex includes a sea-view swimming pool, a pool-side bar and free Wi-Fi throughout the property. All accommodations at the Nostos Apartments feature kitchenettes, and some also include a sitting/dining area. Each is equipped with satellite TV and air conditioning. 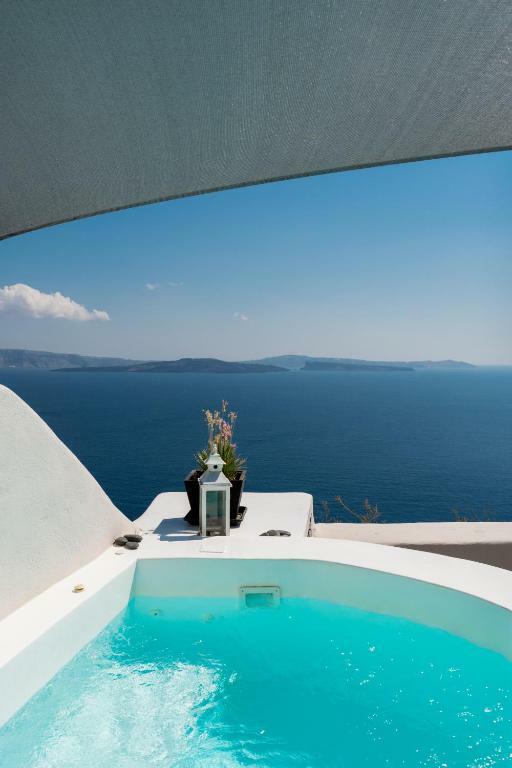 Nostos Apartments are 5.5 miles from the center of Fira and 9 miles from Athinios Port and the Santorini Airport. The Nostos Apartments’ front desk provides information and assistance with car rentals, boat excursions, as well as restaurant reservations. 뀐 Located in the top-rated area in Oia, this property has an excellent location score of 9.6! When would you like to stay at Nostos Apartments? This air-conditioned studio offers free Wi-Fi and a pool with view. Please note that extra beds are not available in the studios. Guests are benefited with a private entrance, a seating area, a bathroom with shower and bath amenities. A flat-screen TV with satellite channels is provided. Spacious apartment with seating/dining area and sea-view porch. Has free Wi-Fi. Spacious suite with sea-view porch, 2 bedrooms, sitting/dining area and kitchenette. Offers free Wi-Fi. This air-conditioned apartment features Caldera view, dining area and hot tub. House Rules Nostos Apartments takes special requests – add in the next step! Any additional adults are charged EUR 60 per night for extra beds. Nostos Apartments accepts these cards and reserves the right to temporarily hold an amount prior to arrival. Please note that the reception is open from 09:00 until 14:00 and from 18:00 until 21:00. All guests are requested to contact the reception through email to inform the hotel about their arrival details. Please inform Nostos Apartments of your expected arrival time in advance. You can use the Special Requests box when booking, or contact the property directly using the contact details in your confirmation. This is a fabulous property, but reaching it requires walking down steep stairs, so if a person has mobility issues, they should be aware of this. The staff was excellent. They were very friendly and responsive to requests and questions. The room was gorgeous and spacious. Breakfast was delicious. Nostos Apartments was also an excellent value and I would highly recommend it! The location was breathtaking. Staff were extremely helpful and polite too. Price of room service food and beverage was great (much better than expected and even cheaper than venues outside the hotel). Had a lovely intimate feel too (boutique hotel feel rather than hotel chain feel). Would love to return here one day! Well worth it! Amazing views. Stylish. Great services. Absolutely everything was perfect! The most amazing and helpful staff that made our experience extra memorable. The staff is amazing!!! Very friendly!! The fresh orange juice at breakfast is great! Amazing romantic view!! Stefanos and the staff were very accommodating. Nothing was a problem. All our suitcases were carried down and up for us. The guys were supermen. Carried 4 suitcases at once. The view is breathtaking, something you could never get used to. The staff went above and beyond and were extremely friendly. The room was very big and the bed was really comfortable. We were very sad to leave and would definitely stay here again!! They desperately need some shade by the pool (umbrellas), and need to paint the pool deck white instead of black. It’s a beautiful space, but so hot! Needed more access to still water without having to walk all the stairs to go get it The price of room should have included a bottle per day at least!! Steffanos & Nani and entire staff were incredible!